Nairobi — An air strike by the United States forces on Saturday left 52 Al-Shabaab militants dead, in the week the terror group claimed responsibility for the Nairobi attack. A statement from the US Africa Command said 52 terrorists were killed in the air strike conducted in Jilib, in the Middle Juba region. It said the air strike was conducted in "response to an attack by a large group of Al-Shabaab militants against Somali National Army Forces." It followed the Tuesday terror attack at 14 Riverside Drive in Nairobi, where 21 people were killed, including an American and a Briton. In claiming responsibility of the attack, Al Shabaab said it was a "revenge" against the United States decision to move its Embassy from Israel to Jerusalem.. The US Africa command has vowed to heighten a campaign against the Al-Qaeda linked militants, responsible for thousands of deaths in Somalia and the region--including Kenya which is the worst affected. Kenya is among countries with troops inside Somalia where they are fighting under UN-backed African Mission in Somalia (AMISOM). "Alongside our Somali and international partners, we are committed to preventing al-Shabaab from taking advantage of safe havens from which they can build capacity and attack the people of Somalia," the US-Africa command said in a statement. 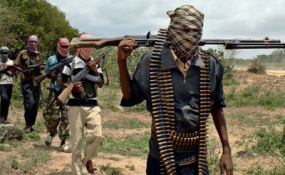 According to reports, Al-Shabaab has been using portions of Southern and Central Somalia to plot and direct terror attacks, steal humanitarian aid, extort the local populace to fund its operations, and shelter radical terrorists. They say the U.S. Africa Command will continue to work with its partners to transfer the responsibility for long-term security in Somalia from AMISOM to the Federal Government of Somalia.